I guess this is an instance of the maxim "If it bleeds, it leads". Anyhow, it's good to see this ingenious idea getting some well-deserved publicity. One thing I believe they took into consideration is that in The Little Mermaid, one of the main plot points is that Ariel's voice gets taken away. I wonder if they only analyzed those parts of the movie in which she is able to speak, or how they compensated for this? Brave is not a Disney film. Anyone with a decent understanding of Disney tropes should be able to see that Aladdin is the "princess" in the story. @Thorin: It's an interesting observation, but something tells me that it isn't a coincidence that the lead who loses their voice (and a beautiful, singing voice) happens to be female. If it was a boy's story at that time period, I figure the boy would probably lose his power (sword, magic, riches, strength) instead. It's like how Miyazaki once said that he likes writing female leads because he can show them being vulnerable; if Chihiro was a boy, his audience wouldn't sympathize with him running scared to cry in a corner (in the director's estimation). @KeithB: You can argue that on production grounds, but at any rate Merida is a Disney Princess in the formal sense of the term. Does the analysis include words sung by the female characters? I would expect that this would swing "Frozen" more toward the female side, and would make the results even more surprising if it is already included. One limitation of this sort of analysis is that a movie is not its script. Rather, dialogue and visual images combine synergistically, and the way in which "ideologies . . . are presented to children" depends on the overall combination. So e.g. it seems hazardous to infer that a ratio in how often female v. male characters are described in dialogue as visually attractive will be identical to the ratio how often female v. male characters are visually depicted as conventionally/stereotypically attractive. And indeed it seems plausible that affirmatively unattractive female characters (evil stepmother, wicked witch, etc.) are not necessarily described as such "out loud" as opposed to just being thrown up on the screen looking so cartoonishly ugly that the point can't be missed. Show don't tell, the cliche runs. Now if in a given movie the Prince Charming character is just as stereotypically good-looking as the particular Princess at hand but the latter has it pointed out notably more often in dialogue, that discrepancy well might tell you *something* that might be interesting, but I think you need the broader context (which is frankly probably significantly harder to quantify) in order to have a good sense of what that something might be. Female only songs: "For the First Time in Forever", "Let It Go", "For the First Time in Forever (Reprise)"
Male and female songs: "Love Is an Open Door", "Fixer-Upper"
Male only songs: "Frozen Heart", "Summer"
We could also include "Reindeers Are Better than People" in the last category, though it's only about four lines long. There's also the male and female chorus in the music at the beginning and end, but I wouldn't count those as "lines" by "characters". Of course in the case of Mulan the whole concept of the movie is that the woman succeeds in a traditionally all-male profession (and some might say that is what makes it empowering) so you would almost have to have mostly male characters. But I do think there is a point that in general a lot of these movies, even when the main character is female, use predominantly male supporting characters / comic releif characters etc. He presents as male, has a traditionally male name, and is gendered as male by the other characters, (I don't specifically recall whether pronouns are ever used for him, but he is called "little guy" at one point – and although "guys" can be gender neutral in some contexts, this isn't one of them). He also has a male voice actor and is called a snowman, but I'm not sure "snowman" is actually gendered in its usage. I realize now I forgot "Do You Want to Build a Snowman", for the female only category. There may be others I've overlooked. Yes, he's called "he"/"him" by the other characters. After "In Summer", for example, Kristoff says "Somebody's gotta tell him." Thanks Mark! Being mentioned on language log was on my bucket list. ;-) Looks like we may be on CBS morning news on Friday. My 15 minutes lol. FYI we did not include songs in the word count, but will be looking at them separately. @leoboiko that's something I hadn't considered, and is also an unfortunate truth. Also, I much appreciate any mention of Miyazaki in conversation. 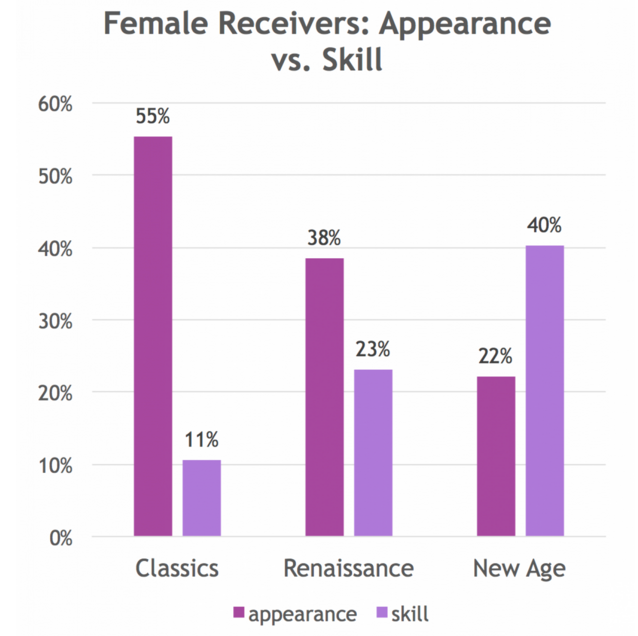 According to the bar graph, female characters has received 66%, 61%, and 62% of the compliments in the 3 time periods. Presumably, it leaves 34%, 39%, and 38% of the compliments to the male characters. What is the distribution there and what does it tell us? I would have looked up and reported, but the paper doesn't seem to be publicly available. Which is a bit disappointing — a lot of press, TV rolls in, bing, bang, but nothing to chew on. Tempora, mores, blah-blah-blah. 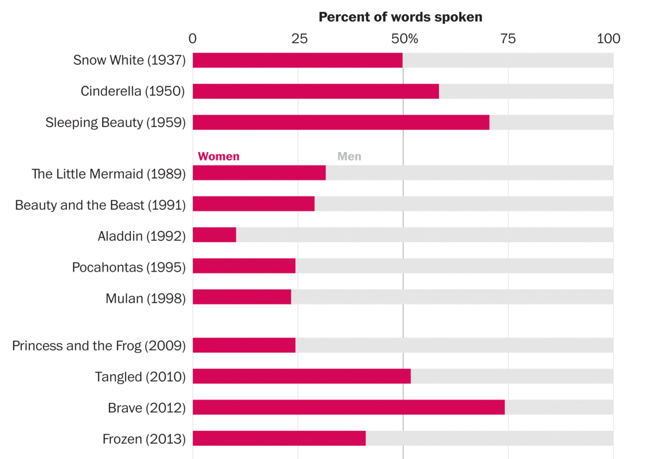 I'm not a Disney expert, but going by memories and plot summaries, it seems to me that quite a bit of the variation in word percentages can be explained by the gender of the main villain in the sample – Classics have evil witches and queens, Renaissance movies mostly ruthless and greedy men, and New Age switches between types. This may mask other diachronic patterns. You have to remember that a lot of these princess movies are based on fairy tales, and a lot of the ones that are not are emulating them. You might ask why Disney is making these types of movies, but I believe they wouldn't be if there were no demand for them. In fact, a lot of the "new age" movies are shoehorned into the "princess" category for political reason (I would call "Frozen" a real princess move, however). I'm not sure I understand what point you trying to make. That Disney is responding to the sociological context in which it and its audience exist is the very fact that makes this a worthwhile topic of investigation, not a fact that makes it uninteresting. I came here as soon as I read Jeff Guo's article in the Washington Post. I confess that I expected to see the research ridiculed as tendentious and reductive, mainly for the reasons J.W. Brewer very gently points out. I'm not a professional linguist and I'll readily defer to those who are, but doesn't JWB have a point? And how is this different from the kind of fly-specking that results in counting occurrences of first person singular in State of the Union speeches? There are certainly limitations on the usefulness of this kind of data as a proxy for various complicated factors about the presentations of people by gender in the media, but comparing this to the first person pronoun posts isn't really justified. The primary reason the first person pronoun claims were ridiculed here was because they were factually false. People were claiming that first person pronouns were used more in some texts than others while the data showed that exactly the opposite was true. A secondary issue is that it's not at all apparent how the rate of first-person pronoun use can work even as an imperfect proxy for egotism, unlike measures such as number of lines, which I would expect to be uncontroversially regarded correlated to character significance, though obviously not necessarily a reliable indicator in individual instances. As for this paper, which presumably contains actual data that was not fabricated or simply lied about, I haven't read it. But what conclusions does it draw that you think are unjustified by the data? I can't offer an opinion on that because no real conclusions aside from summary of the data have been reported on, if any conclusions other than data summarization were drawn (which is not to suggest that any synthesis beyond data summary is necessary to justify the paper). Was this data used to argue some tendentious thesis? @J. Goard: I don't understand Disney tropes much, but I agree that Aladdin is the main character, is in the title, and is involved in the most action. Actually I had trouble of thinking of any women in the Aladdin movie (there is one, IIRC, but her role is fairly minor, and both the main hero and the main villain are male). 2) Also, my experience accords with some of the information being discussed: At an early age, my daughter Arden became accustomed to (and l surely began to internalize) the idea of being visually appraised in public As a 2+ year old, the preschool teachers would welcome each girl in the morning with a "Well don't you look pretty today? What color is your dress?" etc., while the boys would simply be encouraged to run off and play, usually on the indoor slide and tunnels or sth more or less physical. Apparently The Lion King doesn't make the list, but it would probably be down there with Aladdin, for the same reason: almost the only female character is the love interest, who doesn't even have that big a part. A few of them are arguably thrown off by the existence of one character who does way more than their share of talking even though they may or may not be all that important (Mushu, Naveen, Olaf) — but then you could just ask as Daniel von Brighoff does why there aren't any of those motor mouths who are female? One thing that struck me with the Washington Post article was how dismissive the comments were. When I read the story, the comments were a mix of various kinds of criticism, often dismissive or hostile. There were the comments that implied entertainment has no teaching function and does not model behavior. There were also anti-feminist, anti-academic, and anti-media comments. The section of comments I read had no positive comments or constructive analysis of the article. In addition to researching the movies and refining their analysis, researching the comments and analyzing them might be a source of useful information, too. Yes, I know comment forums can be sewers of negativity, but as a person interested in understanding the world around me, I would like to understand better why some people don't want to understand the world around them. I think I'm drifting off-topic, but as long as we're discussing aesthetic praise of women—and Merida as a Disney Princess: I find it incredibly interesting how many of Merida dolls have her dressed in the princess dress (1, 2, 3, 4, 5, 6, 7…). For those who haven't watched the movie, the dress is symbolic of her refusal to be a passive, pretty thing; she explicitly torns it apart as unpractical for archery, and spends the rest of the movie in a simpler adventurer's dress and cape. Back then, it took me a good deal of time to find a doll with that gear. At least this became an opportunity to discuss this very issue with my daughter; it drove home the point that Merida's fictional struggle reflects real life.